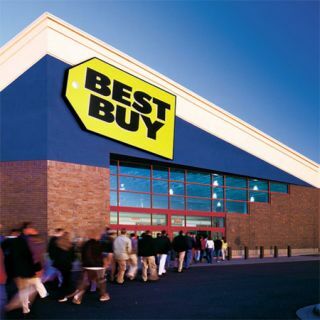 HOT DEALS: Up to 50% off in the Best Buy closing down sale | What Hi-Fi? It's Cyber Monday, supposedly the busiest online shopping day before Christmas, and Best Buy is kicking off proceedings with up to 50% of DVDs, Blu-rays and CDs in its closing down sale. There's also 10% off TVs, DVD players, MP3/4 portables and gaming hardware, 20% off home audio plus 25% off AV accessories. Just add the code BBY when checking out on the Best Buy website to get the discount. Deals we've spotted include an LG 50PW450 plasma for £499.99, a Samsung UE32D4003 LCD/LED TV at £479.99, LG 50PZ250 Full HD plasma at £698.99 and an HD Ready LG 32LK330 LCD at £299.99. All TV prices quoted are before the 10% discount is applied. Blu-ray players on offer include the Sony BDP-S480 and Panasonic DMP-BDT110, both at £79.99 (save £20), and the Samsung BD-D5100 for £62.99. Some of the biggest savings are on software, with Blu-ray discs from £3.49 – although the choice is limted – and DVDs from £1.99. There are discounts to be had on top-brand AV receivers including the Yamaha YHT196 (down £80 to £319.99), Onkyo TX-NR579 (down £86 to £343.99) and Pioneer SC-LX75 (down £300 to £1199.99). You can also pick up a Panasonic SC-BTT362 2.1 Blu-ray home cinema in a box system for £251.99, a saving of £28, and a Samsung SMT-S7800 Freesat 500GB HD recorder for £215.99. There are plenty of deals on speakers too, with a pair of Q Acoustics 2010s all your for just £87.99 (save £20). Stocks are likely to be limited, so head on over to the Best Buy website to see these and other offers before they run out.